They invariably pop up at the least opportune moment, when you're trying to wrap up some important work email or, worse yet, mid-Netflix binge. They're software update notifications -- those unwelcome, near-daily interruptions reminding you that some piece of random software -- or the OS itself -- has an available update to install. Ain't nobody got time for that right now, I'll do it later you think to yourself, and immediately dismiss it by tapping "Remind me tomorrow." 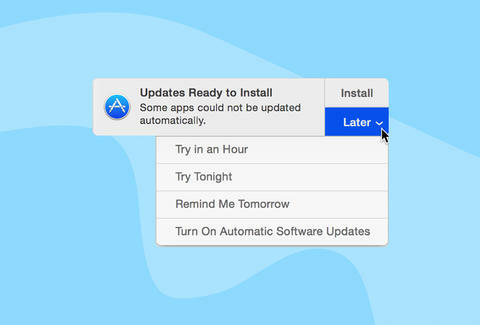 Thus begins an irritating daily routine until you eventually give in and install it. Well, my friends, I come bearing great news -- you can easily disable those pesky little windows for good! Here's how. 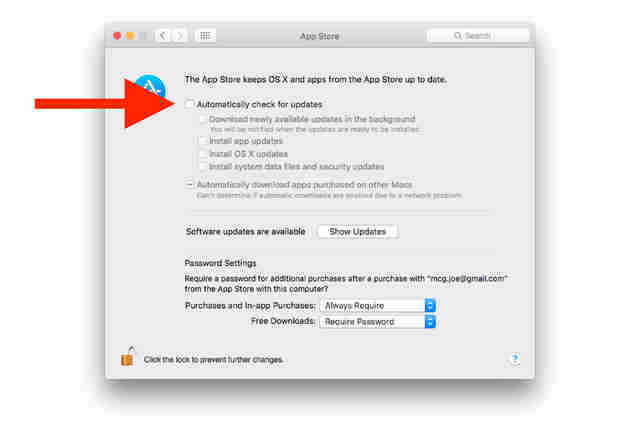 First, go to System Preferences (either via the Apple icon on the navigation bar along the top of the screen or the cog wheel in the application dock). Find the "App Store" icon and click it. Here's the caveat: ditching regular software update install reminders is one thing, but not updating your Mac software is bad. So, if you're going to forego the reminders altogether, you'll want to periodically check in and see what needs an update every month or two. This is easy -- simply go back to the App Store and it'll show you a comprehensive rundown of every available update, and give you the option to download them right then and there. Joe McGauley is a senior writer for Thrillist and would appreciate if software updates could just, like, be a little more self-sufficient, you know?